Metal fans were treated to a stacked bill on Friday night at the UC Theater in Berkeley, as The Black Dahlia Murder brought their “Infinite Bringers of the Night Tour” to the Bay Area. With seven bands and over six hours of heavy music, there were plenty of amazing moments, enough to make even the most stoic of metal fans smile with joy. After two solid opening slots from LA death metal band Skeletal Remains and the one-man darkwave/metal project Gost, Khemmis took to the stage to rip through an epic set of doom metal. The band has been hard at work touring in support of their outstanding new record, Desolation, and it clearly showed as the group sounded excellent. The keys to the band’s sound are the soaring twin guitar harmonies and fierce riffs of Phil Pendergast and Ben Hutcherson, who nimbly blend crushing sludge riffs with Iron Maiden-style harmonies. Next up were local favorites Ghoul, who brought a Gwar-style extravaganza to the stage. Each member of Ghoul dressed up as well, an unidentified zombie or ghoul, with a bag over their head and blood dripping down their face. Much like Gwar, Ghoul does battle with various villains on stage, eventually killing them in brutal fashion as blood sprays the audience. Musically speaking, Ghoul plays a style known as splatterthrash, a sizzling take on classic Bay Area thrash metal with gory lyrics to go along with the buzzsaw guitar riffs. Just as the crowd was getting warmed up and the fake blood was drying on their shirts, Power Trip strode onto the stage to deliver an overpowering set of crushing thrash metal. There is a reason the five-piece has become one of the most popular bands in the metal underground, winning over not only diehard metalheads but also the likes of Fox News host Greg Gutfeld: they deliver some of the purest and most exciting metal music out there. Beginning with the slamming thrash of “Manifest Decimation,” Power Trip pulverized the audience with their trademark buzzsaw guitar riffs for the next half hour. As usual, frontman Riley Gale was a force of nature on stage, and it was hard not to get amped up watching him move around on stage. The band wasted no time in rolling into their next song, the blistering “Executioner’s Tax (Swing of the Axe),” another killer cut from last year’s Nightmare Logic album. A few songs later, the band brought out a brand new song, the devastating “Hornet’s Nest.” The track relied on some rhythmically complex guitar work from Chris Whetzel and Nick Stewart, who mixed speedy single-string runs with fierce open-string chugging. As Power Trip walked off stage, there was a palpable sense of excitement in the audience, as the best part of the show was just about to start. Pig Destroyer have developed a reputation as one of the best grindcore out there and for a good reason: the sheer brutality of their live sound is one of a kind. Like any good grindcore band, Pig Destroyer do not waste any time getting to the point, namely atonal guitar runs, slamming blast beats and the guttural wail of J.R. Hayes. In just about a half hour, they managed to cram an impressive 19-song set in, savaging the audience with plenty of songs from their latest release, Head Cage. The sheer force of nature that is the band’s sound was truly something to experience. Pig Destroyer made every single note count, as their entire set blurred into one unstoppable wall of heavy metal fury. The Black Dahlia Murder has become known in metal circles for putting on an impressive live show, and they did not disappoint, as the band was clearly firing on all cylinders. With a seizure-inducing light show that was synced up to drummer Alan Cassidy’s kick drums, and a superb mix, the band opened the set with the ferocious “Widowmaker” off of their most recent release Nightbringers. TBDM kicked things into high gear after that, moving from classic material along with plenty of newer songs. Lead guitarist Brandon Ellis made his presence known throughout as he dazzled the audience with his impressive lead work on songs like “Miasma.” Of course, the rock-solid rhythm work of Brian Eschbach and the vicious vocals of Trevor Strnad helped make these songs even more powerful. What makes TBDM such an incredible band is their ability to blend atonal death metal with more melodic, European-style metal, and this combination makes for songs that hold the listener’s attention, such as the classic “Statutory Ape.” The song mixed pummeling open-string chugging with grandiose melodic sections and plenty of wild lead guitar work from Ellis. Halfway through their set, Strnad said that this was the coolest tour they had ever been on, a testament to the incredible array of bands and metal styles present and also the high-level performances from each band on the bill. 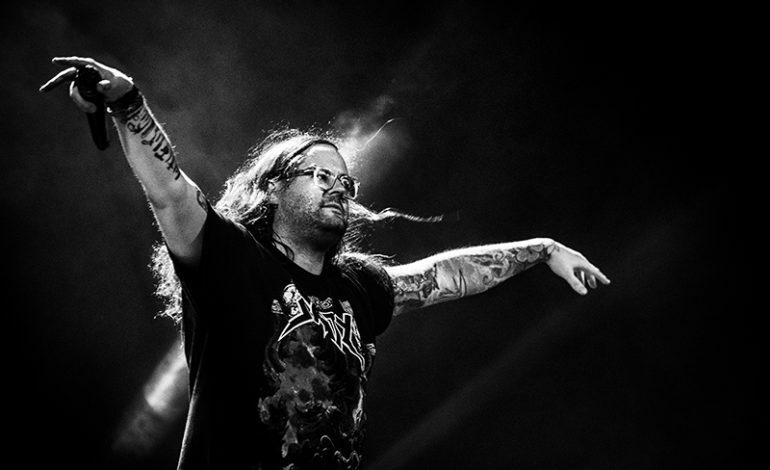 When it comes to extreme metal, few bands are as overpowering and convincing as The Black Dahlia Murder, who are still on top of their game.